• Paper is sent to 2 reviewers for review. The reviewers' recommendations determine whether a paper will be accepted / accepted subject to change / subject to resubmission with significant changes / rejected. • If the paper is accepted by the reviewers, author(s) will be notified to pay the publication fee. • Acceptance letter will be provided after the payment has been made. • Author/Corresponding Author will be notified about the possible date of publication (both online and print). • One hard copy of the published journal (Print) for each article will be sent to the author/corresponding author. The review process takes maximum two weeks. 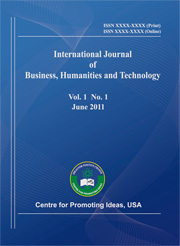 Copyrights for articles published in IJBHT are retained by the authors, with first publication rights granted to the journal. The journal/publisher is not responsible for subsequent uses of the work. It is the author's responsibility to bring an infringement action if so desired by the author. If the paper is accepted for publication, author(s) will be asked to pay 200 USD as article publication fee in order to defray the operating costs. Waiver policy is not applicable. The payment method will be notified by the editor after the acceptance of the paper. Author(s) will be entitled to one copy of the printed journal with free of charge i.e. one printed copy is provided against one article disregarding the number of the authors .Authors can also get additional copies of the printed journal by paying 30 USD for each additional copy.